People are talking about Citroën again in a way that recalls their halcyon days of technological innovation and stylistic idiosyncrasies. Take the latest model to wear the double chevron badge, the DS5. Now that Citroën has retired the loved-only-by-enthusiasts C6 from its UK line-up, the current flagship of the DS Series also becomes the standard bearer for the whole marque. It’s bold, visually intriguing, luxurious and mechanically interesting. Can it further banish memories of the worthy but dull models churned out in the 1990s and be justifiably mentioned in the same breath as the original DS and its descendents? There’s little argument that the DS5 is one of the most distinctive cars on the road and the most cohesive of the current trio of DS Series designs. What’s not immediately evident is what body-style it is, appearing to be an amalgam of hatchback, estate and coupé themes. 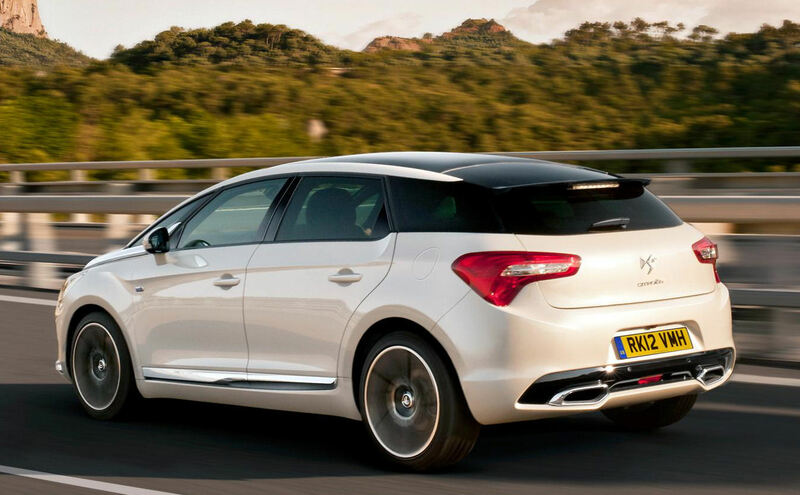 If ever a car earned the ‘crossover’ description, the DS5 is it. Every body surface is garnished with chrome embellishments, interesting creases and daring details, chief amongst them being the polished sabres that link the headlights to the glasshouse, a feature previously seen on recent Citroën concepts. The roof slopes gently down to a rounded, glassy taper at the back of the DS5; body coloured cant rails end mid-way along the fourth side window, mimicking the roof-mounted indicator trumpets on the original 1950s DS. Climb aboard and sink into the sumptuous surroundings that surprise and delight. This particular DS5 is in top of the range DSport specification, costing over £32,000. Many will baulk at paying such a steep sum for a Citroën but the comfort, quality and attention to detail inside the DS5 is befitting of a car costing significantly more. 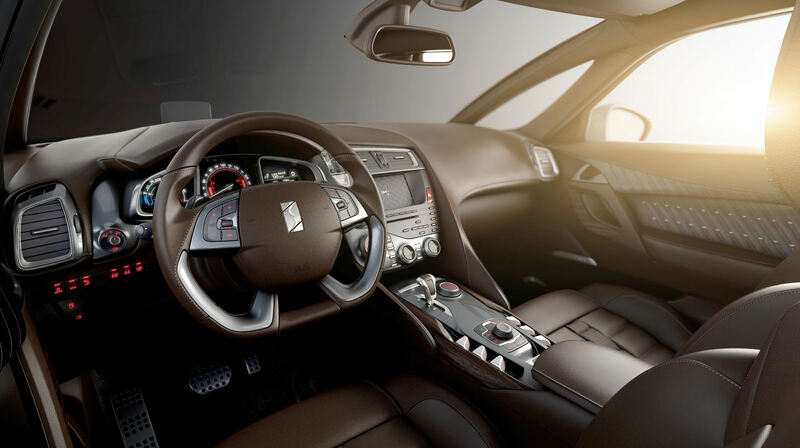 Five adults can get snug inside the DS5, experiencing a wealth of exquisite detailing. The plastic mouldings are reassuringly chunky and thick, the whole dash moulding being focused upon the driver. Switchgear feels almost bespoke, with beautifully damped actions making you long to operate various functions repeatedly. Being a Citroën, not all the controls are where you would necessarily expect to find them, with a plethora of toggle switches built into a central spine along the roof panel, aircraft cockpit style. Seats are richly swathed in a fine quality hide that Citroën claims is on par with the leathers used by Aston Martin and Bentley. The padded watchstrap look gives the DS5 a distinctive air, nodding in reference to a similar pattern on the 1970s SM. Modern market pressures and the sheer expense involved mean that Citroën doesn’t innovate in the way it did in its heyday but the HYbrid4 diesel-electric powertrain on this DS5 offers a further derivation for alternative-fuelled vehicles. The system is shared with Peugeot and offers a fine combination of power (200bhp), fine economy (claimed 68.9mpg on the combined cycle) and low emissions (107g/km CO2). The diesel-electric mix is controlled via a rotary dial next to the automatic gear lever on the centre console. It can be left to its own devices, switched into Sport mode where engine revs climb higher before upchanges occur, pure EV mode (with a short range of zero emission travel) and four wheel drive setting. On the road, the DS5 HYbrid4 feels grunty and responsive, with a constant slew of power at your right foot’s disposal, suiting its stated nature of being a luxurious grand tourer. So all’s good? Sadly, not quite. For many, the Citroën hallmark is the fabled magic carpet ride, a famed benefit of the hydropneumatic suspension system. Even metallic, conventionally sprung Citroëns typically ride with delicacy and supple refinement. 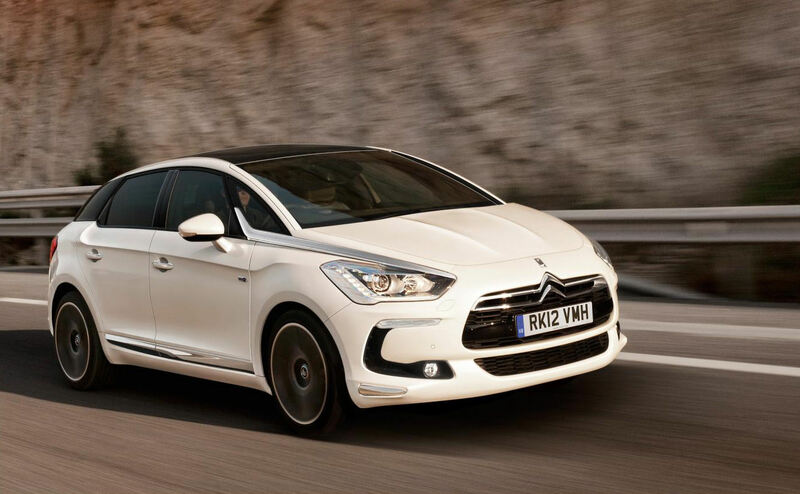 Yet in the DS5, Citroën has somehow shot wide of the mark. It copes with the bigger undulations and ruts you can actually see on the road well, handling with composure and an air of sportiness. But the secondary ride comfort, the one that looks after all those surface imperfections, seems like an afterthought. Those minor asphalt ripples send vibrations through to the cabin that take the edge off what should be a cosseting experience, particularly at lower speeds. Citroën’s DS5 is a captivating car to look at and be within, offering refinement, build quality and luxury hitherto not associated with the brand. In HYbrid4 format, although expensive, it’s engaging, brisk and refreshingly fuel efficient. But, the secondary ride quality needs honing if the DS5 is going to enjoy the plaudits its appearance deserves. For a marque with as much understanding of ride comfort as Citroën has, this needs to be a quickly resolved priority.